American actor Lawrence Talbott (Benicio Del Toro) receives a letter from his brother Ben’s fiancée, Gwen Conliffe (Emily Blunt), informing him that Ben has met a terrible death at the hands of … something. And terrible was Ben’s death indeed — the film begins with his slaughter, and it isn’t for the faint of heart. And so Lawrence returns to his ancestral home of Talbott Hall in England, where the crestfallen Lady Conliffe is staying with Lawrence’s father, John (Sir Anthony Hopkins). Even in grief, John exhibits what seems to be a barely restrained balance of danger and glee. As commanding as he is on stage, Lawrence seems to retreat inside himself in the dark, dank, cobwebbed halls of his old home. Whispers of old secrets hide beneath the dust, and memories best left forgotten are told anew with every creaking floorboard and door. He remembers the night he found his father holding the bloody body of his mother, a raven-haired goddess not unlike the very same gypsies John suspects of Ben’s murder, who had taken her own life with a straight-razor. Less clear are the intervening years, lost in the foggy confines and shadowy corners of the insane asylum John committed Lawrence to in the aftermath of his beloved mother’s death. When Lawrence visits the gypsy camp on a night when the moon rises full and high, he’s not the only one who arrives seeking answers. The townspeople who fear another slaughter are there to take away the mangy old bear the gypsies travel with, confident that it must be the culprit. But something else waits in the mist, and when it strikes, there will be neither peace nor safety for gypsy, commoner, or nobleman alike. Lawrence shows great bravery during the savage monster’s onslaught, saving a mother and child and chasing after the creature with a rifle. The gypsies only barely rescue him from having his throat torn out by the wolf-like assailant, but the bloody chunk the beast ripped away from his neck is the least of his worries. For when the next full moon rises, Lawrence undergoes a violent change that leads him to do great and terrible things. He fears Gwen will be his next victim, while Gwen desperately aches to save Lawrence since she couldn’t save his brother. 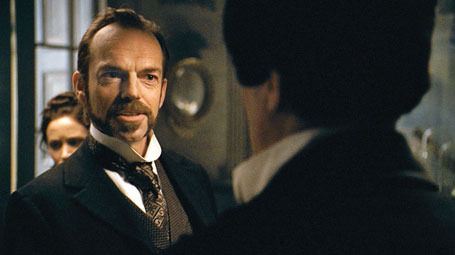 While Scotland Yard’s Inspector Abberline (Hugo Weaving) brings his Jack the Ripper experience directly into Lawrence’s seemingly doomed path, Old John Talbott watches the proceedings from afar with wise, wild eyes, pushing all involved toward a bloody conclusion that will require a miracle of love just as powerful as the ancient evil that blurs the lines between where man ends and beast begins. Anyone who’s ever seen a movie will figure out The Wolfman immediately, but its obvious secrets don’t make it any less fun. It’s difficult to judge the screenplay by Andrew Kevin Walker (Seven, Sleepy Hollow) and David Self (The Haunting, Thirteen Days, Road to Perdition) because it’s impossible to know how much of it actually made it to the screen; the film went through a difficult post-production period of re-shoots, re-edits, and re-structures involving everything from the special effects to the musical score. (For example, composer Danny Elfman was in, then out, then in again.) Director Joe Johnston (The Rocketeer, October Sky, Jurassic Park 3) is no stranger to special-effects movies, and his last minute replacing of original director Mark Romanek (Weezer’s “El Scorcho,” One Hour Photo) doesn’t seem to have affected his confident delivery of the final product. Its checkered pedigree aside, the end result is lean and mean, though some odd bits of dialogue seem to suggest scenes cobbled together from portions of entirely different shoots. 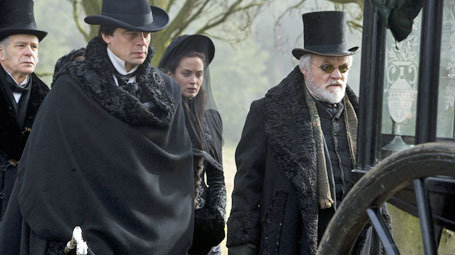 (Examples: Abberline twice tells Lawrence in the same scene that he’d like to have him examined by experts at his convenience, and Old John uses the “prodigal son” line on Lawrence twice when it seems more likely that different script drafts only called for one or the other.) Also frustrating are the special effects, which range from some of the absolute best makeup and practical effects I’ve ever seen (thanks to the legendary Rick Baker) to some of the most awful computer effects ever rendered, sometimes together in the same sequence. You go from marveling at the technical prowess on display to groaning inwardly at how cheaply some things appear. For example, when Lawrence visits the gypsies, the grizzly bear on display is entirely computer-generated … and it looks that way. How difficult would it have been to get a real bear? Similarly, another scene involving what’s supposed to be a magnificent stag looks ridiculous because the stag is obviously a very poor digital creation. Get a real deer! That’s got to be cheaper than paying someone to spend months making one on a computer. Some of the subtler digital enhancements, such as the clouds over Talbott Hall that are black even in daytime, work well. Others, like the digital streetlights and night skies of old England, reduce iconic visual cues to something that looks downright (and disappointingly) fake. All these post-production complaints aside, the movie still worked for me. Intrusive editing tricks still couldn’t take the creepiness out of the flashbacks and dream sequences, and the asylum scenes in particular are effectively terrifying. Without spoiling anything, there’s a mad science element in the film that really ratchets up the terror factor. As for the Wolfman’s rampages, all the gore-hounds out there won’t be disappointed. Stomachs, heads, and long, wet ropes of sloppy entrails are sent flying through the air and splattering across the cobblestones each time the monster’s claws and fangs flash. Many of the scares are brilliantly set up, too, such as the muzzle flash in a dark forest that reveals the Wolfman looming over and behind a doomed shooter who fired in the wrong direction. Despite some very tight editing, there’s still a lot of good stuff that wasn’t lost to post-production jiggles and chops. Gwen wonders, for example, that if the magic exists to create a creature so brutal and wicked, then certainly something else just as magical exists that could save it. Nothing can bring Lawrence’s brother back, but maybe the curse can be ended once and for all. And to this end, the cast is fantastic. Those who criticize Del Toro for seeming a bit too restrained in early scenes with Hopkins and Blunt should also remember that Old John had Lawrence committed to an insane asylum when he was just a boy, leaving a shell of a man who can only open up on a theater stage. (And even then, as Abberline points out in his masterfully written first scene with Lawrence, he’s opening up as someone else, leaving Abberline to wonder who — or what — else might be lurking around inside him.) Del Toro was one of the film’s producers who fought to get it made in the first place, and his passion for the character and for the material is always on display. The performances of Hopkins and Weaving, on the other hand, are appropriately big and certainly lots of fun. I got the feeling that lots of character stuff is missing from the final edit, and the sloppy computer effects, especially in a film that boasts so many incredible makeup creations, are simply unforgivable. If you’ve got a stunt-man who can do it and makeup that can withstand it, leave the computers at home and capture that power on camera! Oh, well. Furthermore, the film hinted at many subplots that never go anywhere. Was Lawrence’s mother a gypsy? I think so, and the more I think about it, the more I’m glad the film left me wondering. I’ll give it a very generous B, and I suspect that the impending directors cut on Blu-Ray and DVD will restore some things that make the movie even better.